As Wrightsville Beach said goodbye to Charlie Maultsby, the former owner of Red Dogs who died unexpectedly last week, his many friends remembered him as a mentor to his employees, an unwavering supporter of local business, and, most of all, a man of unending generosity. “He would give the shirt off his back, whether he knew you or he didn’t,” one friend said. Maultsby — known for building and operating legendary local nightclubs Mad Monk in Wilmington and Red Dogs in Wrightsville Beach — was found dead at his Wilmington home on Friday, Feb. 1. He was 69. Charlie Maultsby after catching a red drum in the Fall of 2016. Maultsby owned and operated Red Dogs at 5 N. Lumina Ave. for 41 years, from its 1975 beginnings as a beach bar with a jukebox catering to the “pink and green, penny loafer, yuppie crowd” until 2016, having transformed it into a modern nightclub catering to a college crowd. 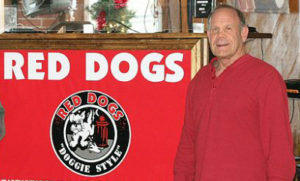 For many, the iconic Red Dogs was a necessary stop in any visit to Wrightsville Beach. 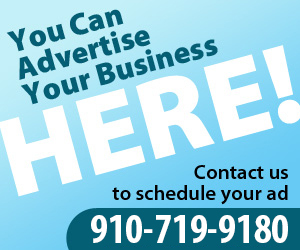 Maultsby helped develop a community with other bar owners and employees in Wrightsville Beach. Danny McLeod, who owned the Palm Room from 2002 -2015, said the two became fast friends and that he appreciated the camaraderie that Maultsby encouraged. Brothers said he vowed to reopen Red Dogs as a way to honor Maultsby. “I’m not sure what will happen now, but in your name I will fight to open those doors again for you,” he wrote. 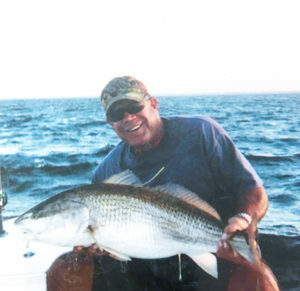 Charlie Maultsby, owner of Red Dogs in Wrightsville Beach from 1975 – 2016, died on Feb. 1, 2019. Many of his friends reflected on his seemingly limitless generosity. McLeod recalled one story that demonstrated his giving nature. After holding a fundraiser at Red Dogs for former Wrightsville Beach resident Jay Miller’s fight against ALS, he gave the entire $12,000 raised that evening, covering costs the bar’s costs out of his own pocket. Brothers said one reason Maultsby donated so generously was because he didn’t have any children of his own. “All the Wrightsville beach kids, they were his family, and he donated so much back to them,” Brothers said. Maultsby’s acts of generosity weren’t always huge, but they often had great meaning to their recipients. When Miranda Zumbro, then a bartender at Red Dogs, lost her friend Margaret Torre Plummer in a hiking accident eight years ago, Maultsby was instrumental in finding a way to honor the young mother of a two-year-old son, creating a new tradition which has since been replicated up and down the beach. “I knew Charlie had a friend that built a bench at one of the accesses. And Margaret was married on Crane Street, so I asked if we could build a bench there in her memory,” Zumbro said. While Maultsby worked on getting town approval, a friend built the bench in work space at Red Dogs, engraving her name in the wood. Zumbro said people have seen the bench and searched for her name. 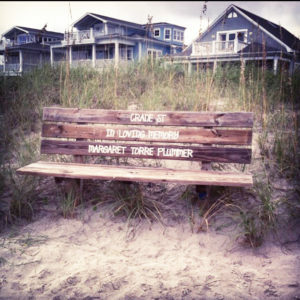 The bench at Crane Street dedicated to Margaret Torre Plummer. Maultsby helped spearhead the project to build the bench in her memory. The tribute has since been introduced to several of Wrightsville Beach’s beach accesses. One friend told the story of how Maultsby and his stepson would buy presents to deliver to children in underprivileged neighborhoods. After receiving a basketball, one kid lamented that he didn’t have a hoop on which to shoot, prompting Maultsby to go to the store that day and buy one for the child. In addition to his business success, Maultsby will also be remembered as being a standout local athlete and his continuous support of local sports programs. An outstanding football and baseball player at New Hanover High School in the late 1960s, Maultsby turned down a scholarship to play running back at the Citadel, instead choosing to play as an outfielder on the University of North Carolina Wilmington baseball team from 1970-1973. Longtime UNCW Baseball Coach Mark Scalf said Maultsby will be remembered for his continued contributions to the program. A former UNCW player himself, Scalf played a few years after Maultsby, but said he soon got to know him as he remained a constant, supportive presence for the program. Maultsby was a constant presence at the annual Friends of the Seahawks golf tournament to benefit the team, “always putting up a team and contributing,” Scalf said. Over the years, Scalf said he had plenty of opportunities to see Maultsby’s generous side. Many will remember Maultsby for his ownership of the Mad Monk, a Wilmington nightclub that drew national acts, from punk band the Ramones to local favorite Hootie and the Blowfish. Maultsby had a talent for bringing live music to Wilmington, where for more than a decade he booked compelling acts at the Mad Monk. One of his greatest gigs was booking the Dave Matthews Band for a show by Wilmington International Airport, McLeod said. Maultsby’s ability to recruit acts to Wilmington was damaged when the House of Blues opened in Myrtle Beach, as that venue banned acts from playing within a 100-mile radius, McLeod said. He also helped local bands develop. Before going on to tour in Europe, Maultsby encouraged local act ASG to practice at Red Dogs on off nights, even letting the fellows have a few beers during rehearsals. The irrepressible Maultsby was renowned for his fights with the Wrightsville Beach town government, time and again besting the town in disputes with the N.C Alcohol Beverage Control Commission over his liquor license. Most recently, he won a battle to retain his license in early 2016, the last in many run-ins with the town, starting with his efforts to start serving liquor in 1991. He also faced a challenge from the town in 2000 when he expanded into the second floor of its location. In a 2016 interview with Lumina News, Jimmy Gilleece, owner of neighboring Jimmy’s at Red Dogs, said he has seen firsthand the impact that Red Dogs has had on the Wrightsville Beach community. “Every week or two, someone comes in and tells the story about how they met their husband or wife at Red Dogs,” Gilleece said. In his 2016 interview, speaking about his 41-year career, Maultsby reflected on how much he enjoyed living in the Wilmington area and enjoyed being a bar owner.